One type of earplugs, for protection against water, dust etc. Exostosis, or Surfer's ear, is a condition which affects people who spend large amounts of time in water in cold climates. In addition, wind may increase the prevalence of the amount of exostosis seen in one ear versus the other dependent on the direction it originates from and the orientation of the individual to the wind. Custom-fitted surfer's earplugs help reduce the amount of cold water and wind that is allowed to enter the external ear canal and, thus, help slow the progression of exostosis. Flanged earplugs, including most types of musicians' or 'Hi-Fi' earplugs. Custom molded earplugs, made from a mold of the wearer's ear and designed to precisely fit all ear canal shapes. Custom molded is further divided into laboratory-made and "formed in place"
NIOSH Mining Safety and Health Research recommends using the roll, pull, and hold method when using memory foam earplugs. The process involves the user rolling the earplug into a thin rod, pulling back on the ear, and holding the earplug deep in the canal with the finger. To get a complete seal, the user must wait about 20 seconds for the earplug to expand inside the canal. Furthermore, they may be either disposable or non-disposable, with foam and hand rolled silicone ones generally being disposable or for use a relatively limited number of times. Custom molded are non-disposable and made from either acrylic, vinyl, or silicone materials. Custom molded come as either vented (for communication) or non-vented (for high noise). A variation of the traditional foam earplug is the no-roll foam earplug that uses a built-in central stem to push the foam plugs into the ears. These earplugs achieve a seal due to their tapered shape, rather than expansion after being rolled. In 1907, the German company Ohropax, which would produce mainly wax earplugs, was started by German inventor Max Negwer. Ray and Cecilia Benner invented the first mouldable pure silicone ear plugs in 1962. The earplugs were valued by swimmers, as well as those trying to avoid harmful noise, for their waterproof qualities. Ray Benner, who was a Classical musician, bought McKeon Products in 1962. At that time the company's sole product was Mack's Earplugs (named after the original owner), which was a mouldable clay earplug. The Benners quickly redesigned the product to a silicone version which would become known as Mack's Pillow Soft Earplugs. 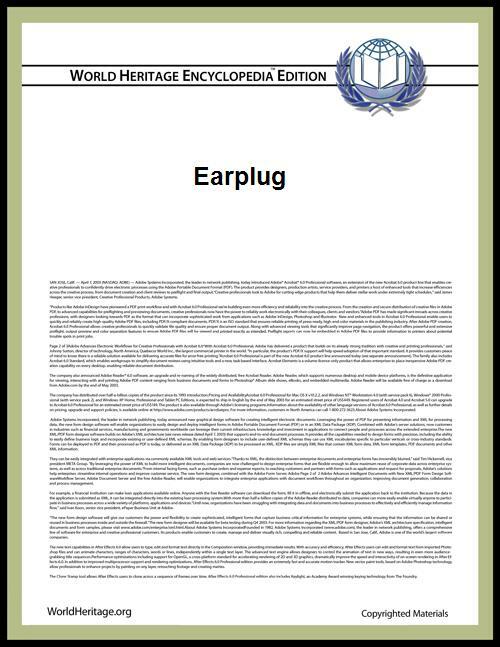 Present-day earplug material was discovered in 1967, at National Research Corporation (NRC) in the USA by Ross Gardner Jr. and his team. As part of a project on sealing joints, they developed a resin with energy absorption properties. They came to call this material "E-A-R" (Energy Absorption Resin). In 1972 the material was refined into commercial memory foam earplugs. Presently, foam, roll-down earplugs have become the most widely used type of hearing protection in workplace applications due to their ease of use, low cost, and effectiveness. They are made from either polyvinyl chloride (PVC) or polyurethane (PU), both of which are high density, closed-cell materials that function as sound barriers. Flight through a CT-image stack. Earplug is stuck in a styrofoam cavity that simulates the ear canal. Earplug adapts to the cavity. ^ King, John F.; et al. (2010). "Laterality of Exostosis in Surfers Due to Evaporative Cooling Effect". Otology & Neurotology 31 (2): 345–351. ^ Chisholm, E.J. ; Kuchai, R.; McPartlin, D. (2004). "An objective evaluation of the waterproofing qualities, ease of insertion and comfort of commonly available earplugs". Clinical Otolaryngology and Allied Sciences 29 (2): 128–32. ^ a b c How To Wear Soft Foam Earplugs." NIOSH Mining Safety and Health""". Cdc.gov. 2012-09-24. Retrieved 2013-06-22. ^ ISO 4869-1 (1990). Acoustics—Hearing Protectors Part 1: Subjective method for the measurement of sound attenuation, International Organization for Standardization, Geneva. ^ a b ISO 4869-2 (1994). Acoustics—Hearing Protectors Part 2: Estimation of effective A-weighted sound pressure levels when hearing protectors are worn, International Organization for Standardization, Geneva. ^ ANSI S12.6-1997 [R2002] (2002) American National Standard for the Measuring Real-Ear Attenuation of Hearing Protectors, American National Standards Institute, New York. ^ Gauger, D., and Berger, E. H. (2004). A new hearing protector rating: The noise reduction statistic for use with A-weighting (NRSA), Technical Report No. E-A-R 04-01/HP, American National Standards Institute, New York. This report can be found online at the following URL web URL http://www.e-a-r.com/pdf/hearingcons/TO4_01EPA.pdf. ^ a b c d ANSI S12.68 (2007). American National Standard Methods of Estimating Effective A-Weighted Sound Pressure Levels When Hearing Protectors, are Worn, American National Standards Institute, New York. ^ Murphy, William J.; Franks, John R.; Berger, Elliott H.; Behar, Alberto; Casali, John G.; Dixon-Ernst, Christine; Krieg, Edward F.; Mozo, Ben T.; et al. (2004). "Development of a new standard laboratory protocol for estimation of the field attenuation of hearing protection devices: Sample size necessary to provide acceptable reproducibility". The Journal of the Acoustical Society of America 115 (1): 311–23. Most moulded earplugs are made from silicone but other materials may be used, including thermoplastics. Pressure and flight earplug molds are less common, as they are typically not used as long as other earplugs, and are therefore less in demand. Noise and decibel reduction earplugs can be molded to fit an individual's ear canal. This is associated with a higher cost, but can help to reduce the discomfort typically experienced after longer use, or if the level of protection or performance is inadequate. Earplugs are also a possible cause of ear inflammation (otitis externa), although the short term use of earplugs when swimming and shampooing hair may actually help prevent it. Still, many pathogenic bacteria grow well on warm, moist, foam-type plugs (polyvinylchloride (PVC) or polyurethane). However, there need also be a loss of integrity of the skin for infection to occur. Hard and poorly fitting earplugs can scratch the skin of the ear canal and set off an episode. When earplugs are used during an acute episode, disposable plugs are recommended, or used plugs must be cleaned and dried properly to avoid contaminating the healing ear canal with infected discharge. There is a possibility for allergic reactions, but this is likely rare, as earplugs generally are made of immunologically inert materials. Earplugs are available which help to protect ears from the pain caused by airplane cabin pressure changes. Some products contain a porous ceramic insert which reportedly aids equalization of air pressure between the middle and outer ear thereby preventing pain during landings and take-offs. Some airlines distribute regular foam earplugs as part of their amenity kits for passengers to aid their comfort during landings and takeoffs as well as to reduce exposure to the aircraft's noise during the flight. These can help passengers get to sleep during the flight if desired. The noise reduction of passive earplugs varies with frequency but is independent of value (soft noises are reduced as much as loud noises). As a result, while loud noises are softened, protecting hearing, it is difficult to hear soft noises. Active electronic earplugs exist, where loud noises are reduced more than soft noises, and soft sounds may even be amplified, providing dynamic range compression. This is done by having a standard passive earplug, together with a microphone/speaker pair (microphone on outside, speaker on inside; formally a pair of transducers), so sound can be transmitted without being attenuated by the earplug. This protects hearing, but allows one to hear normally when sounds are in safe ranges – for example, have a normal conversation when there are no noises, but be protected from sudden loud noises, or hear soft passages in music but be protected from sudden sounds like cymbal crashes. Some musicians' earplugs are custom-made for the individual listener. An audiologist administers a hearing test and makes molds of the ear. 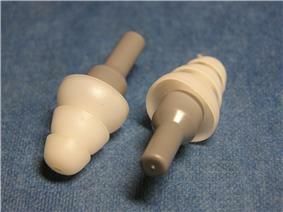 A company then makes a custom ear-piece into which different attenuator capsules can be inserted. These different capsules will provide different levels of attenuation, usually 9, 15, and 25 dB. These types of earplugs will provide the flattest attenuation and the truest isolation from outside noise, as they fit firmly into the individual's ears. They also provide much better protection from very high noise levels. This type of plug is quite popular amongst audio engineers who can safely listen to loud mixes for extended periods of time. They generally achieve this by incorporating a tiny diaphragm to reduce low frequencies, together with absorbent or damping material for high frequencies. This means they can be quite costly, being intended for constant re-use unlike simple earplugs which are disposable. These earplugs usually give an attenuation of only about 20 dB and are not intended for protection from very high noise levels (beyond 105 dB). Musicians who perform music styles noted for their loud nature, especially rock music, often wear earplugs to prevent their own performances from damaging their hearing. Musicians' earplugs are designed to attenuate sounds evenly across the audio band and thus minimise their effect on the user's perception of bass and treble levels. These are commonly used by musicians and technicians, both in the studio and in concert, to avoid overexposure to high volume levels. Alternately, musicians may use in-ear monitors, which are essentially headphones that also serve as earplugs. In 2007, the American National Standards Institute published a new standard for noise reduction ratings for hearing protectors, ANSI S12.68-2007. Using the real ear attenuation at threshold data collected by a laboratory test prescribed in ANSI S12.6-2008, the noise reduction statistic for A-weighted noise (NRSA) is computed using a set of 100 noises listed in the standard. The noise reduction rating, rather than be computed for a single noise spectrum the NRSA incorporates variability of both subject and spectral effects. ANSI S12.68 also defines a method to estimate the performance of a protector in an atypical noise environment. Building upon work from the U.S. Air Force and the ISO 4869-2 standard, the protector's attenuation as a function of the difference in C and A-weighted noise level is used to predict typical performance in that noise environment. The derating may be quite severe (10 to 15 decibels) for protectors that have significant differences between low and high frequency attenuation. For "flat" attenuation protectors, the effect of C-A is less. This new system eliminates the need for calculators, relies on graphs and databases of empirical data, and is believed to be a more accurate system for determining NRRs. Painful discomfort occurs at approximately 120 to 125 dB(A), with some references claiming 133 dB(A) for the threshold of pain. Active ear muffs are available with electronic noise cancellation that can reduce direct path ear canal noise by approximately 17–33 dB, depending on the low, medium, or high frequency at which attenuation is measured. Passive earplugs vary in their measured attenuation, ranging from 20 dB to 30 dB, depending on whether they are properly used, and if low pass mechanical filters are also being used. 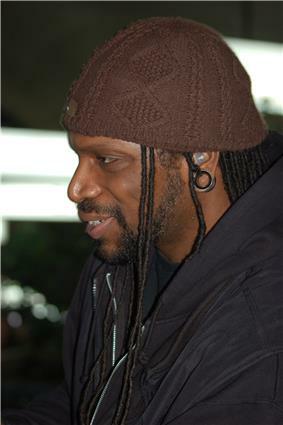 Using both ear muffs (whether passive or active) and earplugs simultaneously results in maximum protection, but the efficacy of such combined protection relative to preventing permanent ear damage is inconclusive, with evidence indicating that a combined noise reduction ratio (NRR) of only 36 dB (C-weighted) is the maximum possible using ear muffs and earplugs simultaneously, equating to only a 36 - 7 = 29 dB(A) protection. 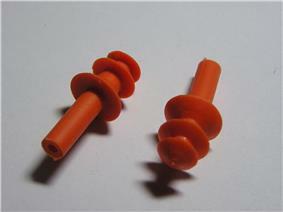 Some high-end, passive, custom-molded earplugs also have a mechanical filter inserted into the center of the earmolded plug, with a small opening facing to the outside; this design permits being able to hear range commands at a gun range, while still having full rating impulse noise protection. Such custom molded earplugs with low pass filter and mechanical valve typically have a +85 dB(A) mechanical clamp, in addition to having a lowpass filter response, thereby providing typically 30-31 dB attenuation to loud impulse noises, with only a 21 dB reduction under low noise conditions across the human voice audible frequency range (300–4000 Hz) (thereby providing low attenuation between shots being fired), to permit hearing range commands. Similar functions are also available in standardized earplugs that are not custom molded. While the NRR and the SNR (Single Number Rating) are designed to be used with C-weighted noise, which means that the lower frequencies are not de-emphasized, other ratings (NRR(SF) and NRSA) are determined for use with A-weighted noise levels, which have lower frequencies de-emphasized. The National Institute for Occupational Safety and Health recommended and the U.S. EPA mandated  that 7-dB compensation between C and A weighting be applied when the NRR is used with A-weighted noise levels. Hearing protectors sold in the U.S. are required by the U.S. Environmental Protection Agency (EPA) to have a noise reduction rating (NRR), which is an estimate of the reduction of noise at the ear when protectors are worn properly. However, due to the discrepancy between how protectors are fit in the testing laboratory and how users wear protectors in the real world, the Occupational Safety and Health Administration (OSHA) and the National Institute for Occupational Safety and Health (NIOSH) have developed derating formulas to reduce the effective NRR. Since they reduce the sound volume, earplugs are often used to help prevent hearing loss and tinnitus (ringing of the ears), amongst other ailments. Other devices that provide hearing protection include electronic devices worn around and/or in the ear, designed to cancel out the loud noise of a gunshot, while possibly amplifying quieter sounds to normal levels. While rich in features, these electronic devices carry a price over one hundred times that of their foam counterparts. Most disposable earplugs are elastic ones made of memory foam, that is typically rolled into a tightly compressed cylinder (without creases) by the user's fingers and then inserted in the ear canal. Once released, the earplug expands until it seals the canal, blocking the sound vibrations that could reach the eardrum. Other disposable plugs simply push into the ear canal without being rolled first. Sometimes earplugs are connected with a cord to keep them together when not in use. Other common material bases for disposable earplugs are viscous wax or silicone. Custom moulded earplugs fall into two categories: Laboratory made and Formed in Place. Laboratory made requires a carefully professionally taken impression be made of the ear canal and outer ear that is sent to a laboratory to be checked and made into a hearing protector. Formed in place uses the same style of process to make an impression of the ear canal and outer ear and then turns that impression into the protector. Both types of custom moulded earplugs are non-disposable with the laboratory made typically lasting for 3 – 5 years and the formed in place lasting for 1 – 2 years. The various methods have slightly different interpretations, however, each method has an effective percentile associated with the rating for which that percent of the users should be able to achieve the rated attenuation. For instance the NRR is determined by the mean attenuation minus two standard deviations, thus it translates to a 98% statistic. That is at least 98 percent of users should be able to achieve that level of attenuation. The SNR and HML are a mean minus one standard deviation statistic. Therefore, approximately 86% of the users should be able to achieve that level of protection. Similarly, the NRR(SF) is a mean minus one standard deviation and represents an 86% of users should achieve that level of protection. The difference between the ratings lies in how the protectors are tested. NRR is tested with an experimenter-fit protocol. SNR/HML are tested with an experienced subject-fit protocol. NRR(SF) is tested with a naive subject-fit protocol. According to Murphy et al. (2004), these three protocols will yield different amounts of attenuation with the NRR being the greatest and NRR(SF) being the least. Australia and New Zealand have different standards for protector ratings yielding a quantity SLC80 (Sound Level Class for the 80th percentile). Canada implements a class system for rating the performance of protectors. Gauger and Berger have reviewed the merits of several different rating methods and developed a rating system that is the basis of a new American National Standard, ANSI S12.68-2007  In Brazil, hearing protectors are tested according to the American National Standards Institute ANSI S12.6-1997 and are rated using the Noise Reduction Rating Subject Fit NRR(SF). and the Single Number Rating (SNR) or High/Middle/Low (HML) ratings are calculated according to ISO 4869 Part 2.